What is the typical current draw? This release is frustrating. I've come to depend on this component for a product I sell. Was there any heads up that you would be abandoning the old form factor? I now have to toss and redesign a batch of PCBs because the taller board ( for daisy chaining purposes?) won't fit. It would be very helpful if you would note in the Features (or Replaces) section above that the Brightness settings are not compatible with the replaced part (now 00 to FF, were FF to 00). Thanks for the Brightness "flip" verification. However, it is a real pain to support two versions of this part, especially since there is no way to tell the difference when using just the Serial RX control. How about making a firmware version for this part that has compatibility with the part that this device is replacing? Power-On shows "0000" instead of blank. Brightness has the 0x00 as brightest, not 0xFF. Fix any other known incompatibility. I could re-flash these 3 units, if it is not too difficult. You can offer this device with "compatible" firmware installed. Then, I could continue using this part with minimum impact to my product. At least it would be easy for you to make the required firmware Hex file and make it available to us, or at least to me. I will look for a description of how to flash new firmware into this device, but maybe you can point me to the right info. I have this module working in a project I built for a friend, and after some time of working properly, it won't work at all (display anything) unless I send the factory reset command via serial. I am using i2c with external pullups, connected to an Atmega328 with arduino bootloader running at 5V. What's weird is that on the same i2c bus I have the big open segment serial display (COM-11644) and that has worked like a charm all this time, while this one has had to be factory reset several times (a pain). They are obviously using different i2c addresses. Â¿Any thoughts on what could be going on? how about some updated firmware?? I tried modifying the code in loop() to display voltage read on the analog pins but all it displays is jumbled up characters. tried uploading the basic firmware again to bring the display back to original functionality but still displays wrong characters when setting over serial. my conclusion would be that the firmware available to download (and the hardware files) have incorrect pin mapping. I'll go through it to try and correct it but it would be nice to have proper firmware!! i installed the hardware profile and tried to upload some code using a 5v basic FTDI but unfortunately i keep getting this error ( avrdude: ser_recv(): programmer is not responding avrdude: stk500_recv(): programmer is not responding) and the uploading stops. what can possibly be the problem? I had the same problem at first, make sure the TX(FTDI) is plugged into RX(Display), and RX of the FTDI to the TX of display. TX does not go to TX, and likewise RX does not go to RX. 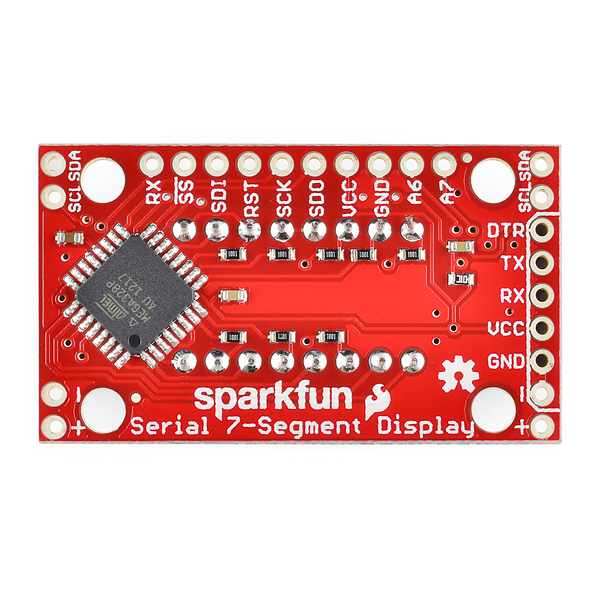 Hi, Is this SparkFun 7-Segment Serial Display - Blue able to show the serial monitor numbers from ARDUINO? In the .ino files the default I2C address is 0x71 if both solder pads are open. Does this mean address can be changed with a solder iron? Can the serial (not SPI/I2C) be driven directly from a Raspberry Pi's serial port? Or am I gonna need level shifting? 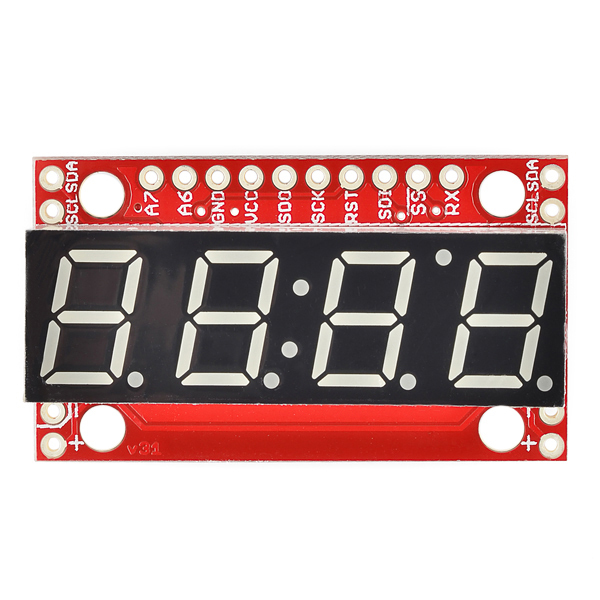 Is it just me or is it nearly impossible to solder a header to the end of the board because the display blocks the holes? It's not just you - but it's not really intended to be soldered to. You'd only generally need to use those pads to hook up an FTDI type programmer, in which case a temporary solution (be that a pogopin bed, some hook clips, or just some quick soldering to the bottom of the board only) should suffice. If you did want a more permanent header, then a right angle header - or just a regular header soldered at 90 degrees - should do okay. For those just starting with the displays, this blue one is nice and bright. I can see it no problem in the daylight. The white 7-segment display is a little tough to see in the daylight, since the color when these are off is white. Analogous to LEDs. Received a defective one today. The baud rate is too far off to work on UART. These do not have a crystal for accurate baud rates. While it is possible to calibrate the internal oscillator I don't think that is being done. I am having trouble getting anything to show up. I have tried both the serial and SPI tutorials. Wired everything exactly like the pictures and used the provided code but still nothing. The other anomaly that is happening is that when wired for serial communication and the ground wire is disconnected the left bottom corner segments flash on the two right "8's* as well as the decimal points for them. Does anyone have any ideas that I could try? I need to send numbers from serial terminal in PIC16F88, to this display, in C language. Can somebody help me? I just need an example, please. How big are the digits? Digits are 10mm tall. For reference, it's this display. 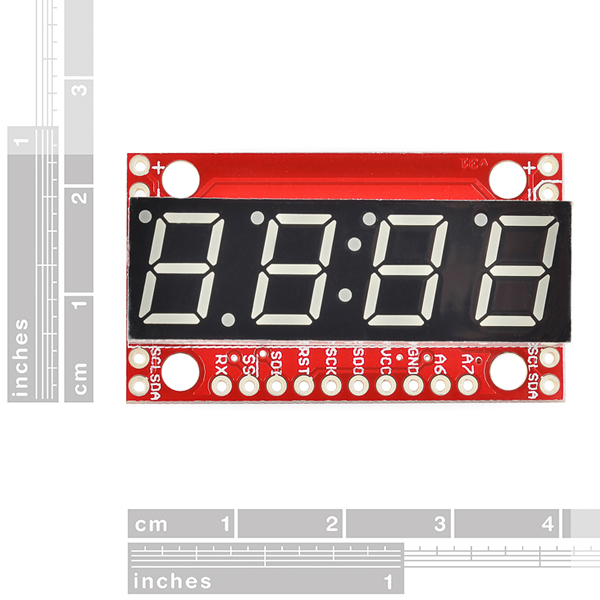 Is there a fritzing template available for this part? What i2c frequency is this board running at? As an I2C slave it doesn't have any control over the clock frequency. It should support a maximum clock frequency up to 400 kHz though. 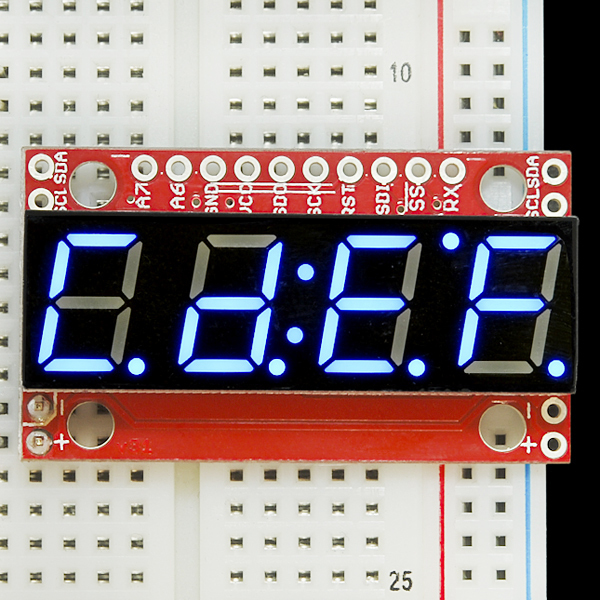 Does this 7-Segment Display include pullup resistors for i2c functionality? No physical resistors, but there are internal pull-up resistors on the I2C lines with a value somewhere around 5-10k. Hi, I have been using the Serial_7_Segment_Display_Firmware sketch, and I cannot make any sense of the output. I have tried a lot of things, including replacing my loop to display a whole bynch of ints, none of which I can make sense of on the display. There are a few segments that never light up. Is my display broken? Is there a coding solution to this problem? I'd like to use three of these for a project I'm working on; is there any way to change the default address of the I2C? Would this be in the bootloader on the chip, itself, or a simple setting I can send it? Sure! You can either send it the I2C address command (send 0x80, followed by your desired address). Or you can reprogram the firmware with your own address defined here. Can I use this like an arduino and hook up sensors to it through spi? The Eagle file schematics here and on github are incorrect and don't agree with the Schematic link (http://dlnmh9ip6v2uc.cloudfront.net/datasheets/Components/LED/Serial-7-Segment-Display-v31.pdf), which is correct. For instance, segment A is on PB0 not PD6, segment B is on PC0 not PB0, etc. I had I2C working using an Arduino Nano. I2C addresses are 7 bits. The 8th bit determines whether it's read/write. So to write, send 11100010 not 01110001; to read, 11100011. Thanks! I'll give that a try and report back when I can get some time to get it done. Nice improvement over the older display. I'm trying to skip the arduino and hook up an analog sensor directly and here is where I am stuck. Jay's Serial_7_Segment_Display_Firmware.ino calls the function setupDisplay(). Yet that function is not defined in the sketch nor is it defined in the settings.h or SevSeg.h header files loaded by the sketch. So what am I missing here? Glad you like it! setupDisplay() (along with a bunch of other system functions) is in the systemFunctions.ino, which is in the same directory as that main firmware file your looking at. I am using 5v for power at VCC. But, you say that 0xFF is full bright, not 0x00. Oops...the meaning of the data byte was indeed flipped around. Now, 255 will set the display to its brightest. More info here (if that'll load for you). The LED segments in this new part have MUCH, MUCH LESS brightmess (same driving code) than what I was getting with the previous part. I tested the new part and then the old part in the same test jig. Has anything changed in the brightness control commands, or in how the brightness is controlled from very dim to full bright? In the old part, the segments are nicely a constant bright. With the new part, they are dim, and flicker a bit. Unless there is a way to get up to the previous level of brightness, this new part is essentially unusable in my application. It is definitely going to be dimmer now with the addition of current-limiting resistors on the LEDs. But it still seems pretty bright to me. Make sure the brightness is set at max (send 0x7A, 0xFF), which it should be by default. What voltage are you powering it at? 5V will give you the brightest display, while 3.3V will be noticeably dimmer. can see the expected characters. Thanks, that is good. using a better power source than the test jig currently has. In incoming QC, I apply 5v to VCC and Ground to GND, but nothing lights up. The replaced unit would show "0000" after power-on bootup. What is different with this new design, please? I tried two parts, and all 3 of the Gnd/Vcc connections. Perhaps you can make the datasheet available as a single pdf? It seems that GitHub complains when I access the datasheet with IE7. This newest version defaults to turning all LEDs off when it's turned on. Seemed less intrusive. Thanks for letting me know about IE8 not loading the datasheet. I'll check into getting another file-type of the datasheet. The link does seem to work in IE9 for what it's worth. I noticed this product is not capable of displaying the character 'y' or 'Y', whereas the prior version of this product had the capability. Am I alone here? Wow! A $13 Arduino (Arduino compatible) with a built in display. Excellent! This is following from member #4643 & 37129, we are still struggling to get the circuit working properly. As mentioned above, one of the segments ("E") doesn't work on any of the digits. Digging further we traced this back to the pins_arduino.h file, our sketch linked to the wrong one which didn't describe the extra pins of the ATMega chip PB6&7 (not needing the external crystal) as digital pins D22 & 23. Indeed D22 is controlling the E-segments. However, when we do link to the right .h file, the Analog Inputs A6 & A7 (which worked previously with the wrong pins file...) stopped working, we get error messages from the compiler that "A6" & "A7" don't exist. We tried "ADC6", no luck. This may be something simple, any suggestions? Really keen on getting this circuit to work, for a project with interactive hand counters for a rehab ward where this can make a big difference. Do you have the Serial7Seg folder installed in a "hardware" directory in your Arduino sketchbook? That should create a Serial 7-Segment Display option in your Tools>Board menu (for more info, see parts 1 and 2 here. When selected, that should handle all the D22/D23 definitions as well as A6 and A7. THANK YOU for posting this. I just bought this and thought there was some kind of bootloader issue because the display would not stop showing 999. I did not realize it was a pinout problem. I am going to repost this on the other colors. They really need to fix this. Yes luckily we found out this little problem, should be al working good now! By the way somehow segment E doesnt work on any digit anymore now just after the weekend.. But thats probably fixed soon and not a general problem, because it worked perfect on friday! Oh and by the way thanks for reposting on the other product pages! We have wired up this nice unit with an FTDI Basic 3.3V, installed the hardware profile for the Arduino IDE, but can't make the display work. We wrote a sketch with Serial.begin(9600) and Serial.write('2') but nothing appears on the display. The Arduino Examples section on the Github is empty, and so is the Customizing the display section.... help! Did you upload new code to the display? 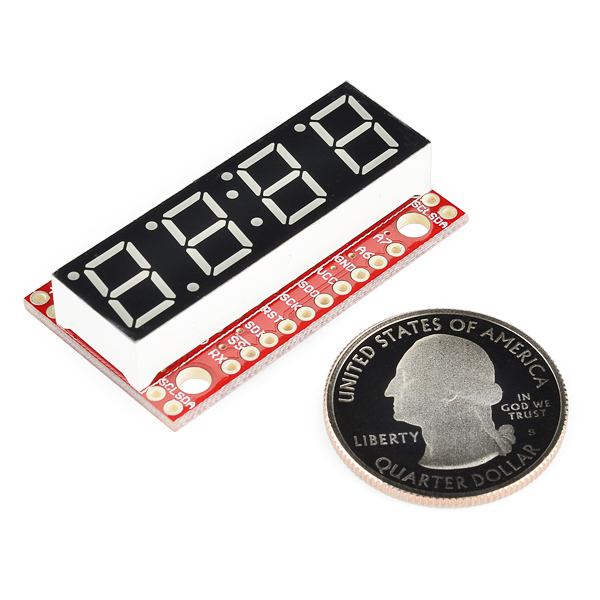 Or is that sketch with the Serial.write('2') on an Arduino communicating with the display? The S7S comes with the Serial_7_Segment_Display_Firmware code already loaded onto it, and is mostly designed to have a separate device send it serial data to be displayed. That said, you can definitely upload your own Arduino sketch to customize the firmware. I updated the customizing the display part of the wiki. Maybe that helps? Thanks for that tip, will try that! Sorry it might not be clear from our previous message, but the case is: we want to put Arduino code on the ATMega238 which is on the displays breakboard itself, so without an extra Arduino! So we just connected a header for the FTDI connection to the display and try to put the code on there! Here is a picture of it Anyone more experience with this so far? I didn't need much I/O for my project so I was able to modify the firmware for this board and run my application and update the display directly. This saved quite a bit on space requirements and cost of not requiring another microcontroller. Note that you will need to add the board to the Arduino IDE hardware folder and get the latest library imported. After that, the default library has a DISPLAY_TYPE constant that defaults to a different version of this device so the LED display doesn't update properly. Make sure to change DISPLAY_TYPE to S7S in the main firmware project file. Are there any python examples for use with a Raspberry Pi 2 utilizing the I2C method? I worked for two days and died. I bought a second one thinking I might have messed up and had the same thing happen. Sorry to hear you're having trouble. Please contact our technical assistance team for help with this.